The number of glaciers in the Himalayan area has increased in the last five decades and this is an indicator of how severe glacier melting has been due to global warming, says the first-ever assessment of climate changeimpacts on the Hindu Kush Himalayan (HKH) region. This assessment, done by the International Centre for Integrated Mountain Development (ICIMOD), a regional intergovernmental body, has synthesised numerous earlier studies due to the non-availability of regional studies. It has brought out a scary picture of the landscape that is yet to be studied well from this perspective. The increase in the number of glaciers is primarily due to glacier fragmentation — that big ones are splitting into smaller ones. And this is happening due to consistent loss in areas the glaciers occupy. “Since the 1950s, only reductions have been observed in glacier area (or shrinkage). Based on a compilation of area change studies, eastern Himalayan glaciers have tended to shrink faster than glaciers in the central or western Himalayas,” finds the assessment. In the northern slopes of the Himalayas, glaciers are clearly receding. Glacier area change ranges between −0.1 per cent/year for the Chandra-Bhaga basin (northwestern Indian Himalayan region) between 1980 and 2010 to more than −1 per cent/year for the Poiqu basin (on the northern slopes of central Himalaya) between 1986 and 2001. Smaller glaciers are shrinking faster than larger ones, although the smaller glaciers of Ladakh show a lower rate of retreat than other Himalayan glaciers. However, the assessment makes clear that despite the surety of glaciers in the Hindu Kush mountains losing length since 1973, no studies have been done to examine area change in this region. Studies on various glaciers in the Khumbu Himalayan region reports rates of area change varied between −0.12 ± 0.05 per cent/year in the period 1962–2005 and −0.27 ± 0.06 per cent/year in 1962–2011. Known as Asia’s water tower with the maximum snow storage after the poles, the HKH region sustains over two billion people directly and indirectly. According to ICIMOD’s assessment, in a 1.5 degree Celsius world, about a third of glaciers in HKH region will disappear by 2100, and under the current emission scenario the region will lose two-third of glacier volumes. “Mountains are warming up faster than the global averages. Even if we could limit global warming to 1.5 degrees Celsius, mountain temperatures would rise above 2 degrees Celsius, and if current trends continue temperatures could go up by 4 to 6 degrees Celsius. This has dire consequences not only on glaciers, but on food, energy and ecosystems, and the people who rely on them in terms of ecosystem change, changing water flow patterns, and increased hazards of disasters,” says David James Molden, director general of ICIMOD. Overall, snow fall and accumulation has been coming down in this region. Since 2000, snow-covered area of HKH has reported a decline. Since 1960s, an analysis of ice cores on the Tibetan Plateau shows, snow accumulation has been decreasing at high altitudes. At the river basin scale, snow-covered area increased in the Indus basin, but decreased in Ganga and Brahmaputra basins between 2000 and 2011. Similarly in Himachal Pradesh, end-of-summer snowline elevation has risen by approximately 400 metres between 1980 and 2007, or at a rate of 14.8 m/year and it lowered by 20 metre/year between 2000 and 2011. The Assessment has been titled “Mountain, Climate Change, Sustainability and People”. According to report, even the most ambitious goal set by the Paris Agreement to limit global warmingwould lead to a 2.1 spike in temperature in the Hindu Kush Region, leading to melting of 1/3rd of the region’s glaciers by 2100, potentially destabilizing Asia’s rivers. If the Green House Gas emissions continue at their current level, the region can loose up to 2/3rd of its ice. So, the amount of GHG emissions will determine the amount of glaciers melted in these mountainous ranges. The melting of these glaciers will put a threat on 1.9 billion people. Hind Kush, the world’s third pole is 3,500 km long spread over 8 countries in South Asia and home to 10 major river basins is under severe threat of climate change. 8 Countries covered by Hindu Kush Himalayas (HKH region): Afghanistan, Bangladesh, Bhutan, China, India, Myanmar, Nepal and Pakistan. 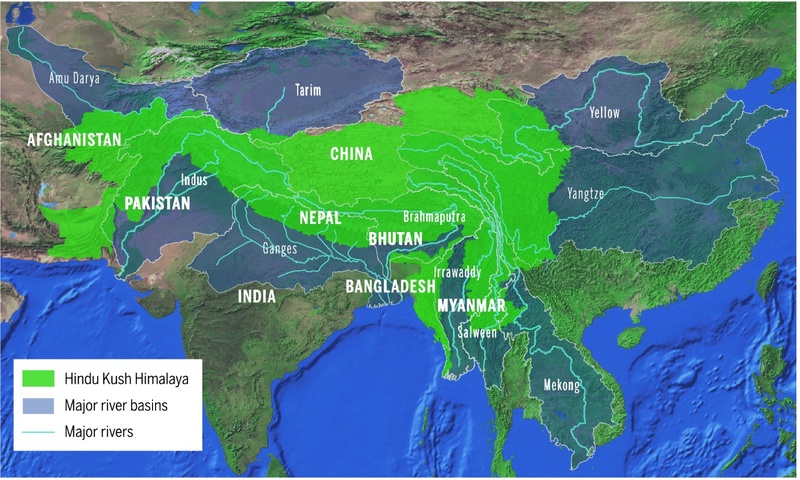 10 Major river basins in HKH region: Amu Darya, Brahmaputra, Ganges, Indus, Irrawaddy, Mekong, Salween, Tarim, Yangtze, Yellow rivers. The HKH region form the largest area of permanent ice cover outside of the North and South Poles, and so are often referred to as “Third Pole”. HKH region is home to 4 global biodiversity hotspots, several important bird areas, and hundreds of mountain peaks. It provides ecosystem services (water, food, energy, etc) to nearly 2 billion people through its river basins. Melting of glaciers can be a threat to water and food security and increase the risks of disasters. Elevation Dependent Warming is a phenomenon of more increase in temperature in mountains than at lower altitudes. Since the 1970s, about 15% of ice in the HKH region has disappeared as temperature have risen. Water supply in the region is closely dependant on rainfall during monsoon and trickling meltwater from glaciers during dry season. Lower flows of river water due to glacial melting will cut power from hydro dams that generate much of the region’s electricity. Farmers in the foothills and downstream will face a serious impact. Climate change is bringing rising incidents of disasters like wildfires, cyclones, hurricanes, droughts, floods, etc. Rising human development and industrial progress are held responsible for the climate change occurring today. Natural resources like trees are being cut for urbanization and non-renewable resources (like fossil fuels) are being used at a very high rate. Global temperatures are rising and extreme weather conditions are being witnessed. Mountain glaciers and ice sheets covering Antarctica, Greenland and Arctic Sea are vanishing. Rapid rise in sea level in recent years has threatened low-lying islands and coastal cities. Wildlife and their habitats are affected. Some species are being pushed towards extinction. Ocean acidity is increasing that threatens shellfish, including crustaceans, affecting marine food chains. Agriculture is facing a threat. Focus on increasing forest cover. Namami Gange Program for cleaning Ganga river. Pradhan Mantri Ujjawala Yojana to increase LPG connections. Waste management has emerged as a priority issue.